Peg's Place On The Rocks sleeps 8. Nestled In The Boulders, Surrounded By Pines! Elegant, Contemporary two Bedroom House Sleeps 8. Great Central Location. This is my mother-in-law's property (I handle her online reservations) and was designed and built by her local architect son, Stephen Dietemann. Beautifully outfitted with fantastic views from every window, overlooking Rising Pond of the Housatonic River. Total privacy set in dramatic boulders and towering pine trees. 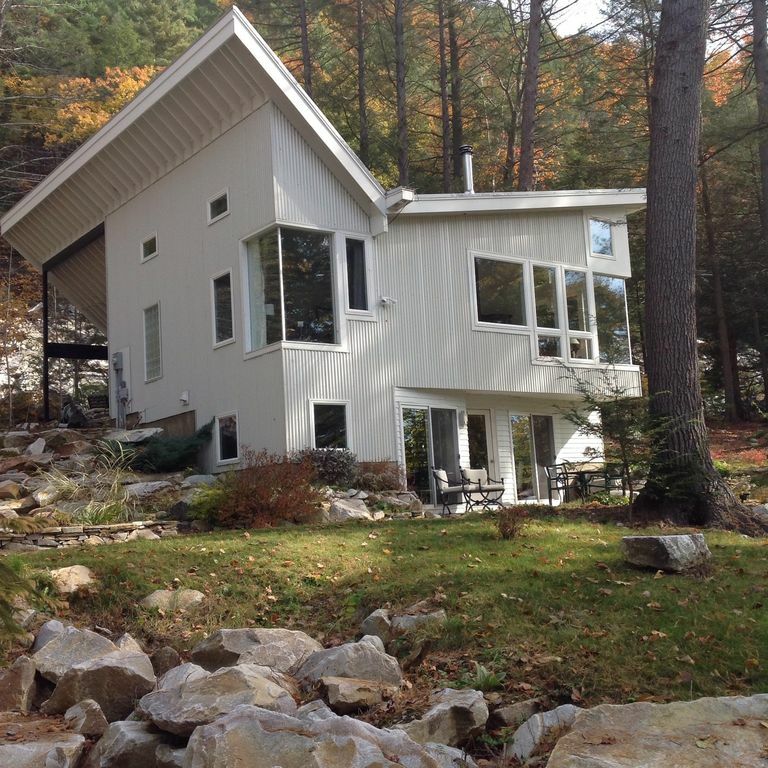 Quality new construction nestled in the pines amongst massive boulders of Monument Mountain. Two bedroom house with sleeper sofas for 4 more. Wood burning stove and carport make winter stays cozy and so easy. Easy access to all winter sports and Centrally located for all summer activities from Tanglewood to Jacob's Pillow. Beautiful architectural details and style, comfortable furniture and new beds. Upstairs there is one bedroom with queen size bed and one large bathroom/dressing area with separate shower and free-standing mermaid tub. New, very comfortable sofa sleeper in main room sleeps two more. Downstairs is another private bedroom with king bed (or can be made into two twins) and another large bathroom with shower. There is also another living area downstairs with a full size sofa bed to sleep two more. Wet bar downstairs and direct access outdoors. Central air and heat and stylish wood burning stove provide coziness in winter. Air conditioning and ceiling fans.. Fully equipped kitchen with all cooking utensils and serving dishes make eating and entertaining a delight. Walking distance to Berkshire Mountain Bakery for delicious french pastries, bread and take-away pizza! Taft Organic Farms is right down the road 1.25 miles. Local loop bus stops a few yards down the road. Accommodates 8 people. You will have full access to the entire house. No one else will be on the property so you will have total privacy. Retired professor of French Literature enjoying my retirement in the Berkshires. My architect son designed and built this lovely dwelling with comfort, ease, and energy efficiency in mind. Peace, beauty and convenience. Centrally located to all Berkshires activities, while still maintaining privacy and quiet. All new construction. Upstairs there is a large bathroom/dressing area with separate shower and free-standing mermaid bathtub. Toilet and vanity in separate area with access from main room without having to go through bedroom. Second bathroom with shower is located downstairs. Guests have full access to all of the property (28 acres up Monument Mountain!) for hiking and exploring but be aware that there has been a black bear that hangs around. Main room with partial views of river through the trees. Sofa bed folds out to sleep two more. Full size kitchen with full size appliances. All necessary cooking and serving utensils provided to make cooking, dining and entertaining easy. 28 acres of pines and boulders at the base of Monument Mountain. Everything you need for a comfortable stay. Lovely home with lots of light. Centrally located. Do not miss the bakery just down the road! We spent two very comfortable nights upstairs, while other family members stayed downstairs. The house is a lovely combination of modern design and "antique" furnishings, including a baby grand piano, and a dramatic mountainside location. The charming village of Housatonic is less than five minutes away, and it's 10 minutes to bustling Great Barrington. We spent a week during Spring 2016 at the house. All about the house is inviting. All of our e-mails were replied to quickly and on point. The owner, Peg, welcomed me in person and helped get me oriented. We took advantage of going many places within 10 min. of the house: Monument Mtn., Taft Farm, Berkshire Bakery, Brickhouse Pub, etc. The house is special in how it brings you together with the wooded landscape along the river. Our time at the house was easy from start to finish. We had an extended stay at this beautiful home during the winter of 2016. The architecture, views, sunlight and windows are all outstanding. The location is central yet private. A left out of the driveway will bring you to Great Barrington in five minutes. Take a right to be in Lenox in 10-15 minutes. Wonderful restaurants and cultural attractions within minutes. The owners were very accommodating. I highly recommend this place for a getaway in the Berkshires. Butternut Ski Area 5mi., Catamount Ski 12 mi. A car is necessary to fully enjoy the Berkshires but the local bus loops by with a stop just a few yards down the road. No smoking. No pets. No parties or events. Have fun!